By upgrading the technical installation of locks and boat lifts of inland waterways, they can be used as pumped-storage plants to store abundant green energy. One major downside of most renewable energy sources is their unpredictable output. Solar- and wind energy could in theory cover a large part of the electricity consumption, even in Central Europe. The German Federal Government has a 35% target for renewable energy by 2020. In order to provide the energy when it is needed, one has to be able to store it. On a large scale, pumped-storage plants are the most efficient way to store abundant electric energy from renewable sources, so far. The downside of these facilities is the huge environmental impact of their construction. By using existing locks and boat lifts of inland waterways with a slightly modified installation, the same effect can be generated without building giant new dams. An additional advantage is that these facilities are spread out over the whole country and can serve as local storage facilities in a decentralized grid. Electricity from renewable sources that is not immediately consumed can be pumped from a lower section of the canal to a higher level, by the existing pumps of the locks. The only additional installation necessary, are the generators to produce electricity when the demand outnumbers the actual supply. Water from a higher level flows through a turbine to power the generator. 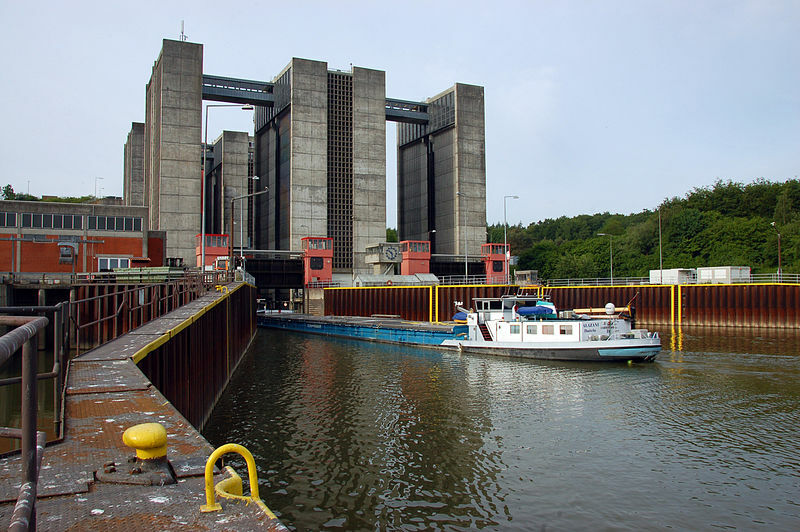 The waterways in northern Germany with a total length of 1300km are equipped with 45 locks and 3 boat lifts. Although height differences at the locks are relatively small, they are suitable for storing energy. Due to German federal law, the water level in a canal may not vary more than 20cm. The idea is to use 10cm of level difference for the storage of electricity. The section of the Elbe Lateral Canal between the Scharnebeck boat lift and the lock at Uelzen with a length of 46km can store 13.300 kWh, enough energy to supply 4 homes for one year. Hubertus Schulte who is working at a Scharnebeck boat lift for more than 20 years came up with the simple but brilliant idea to use the level difference of inland waterways as an energy buffer, comparable to pumped-storage plants. He teamed up with his colleague Jürgen Nölke to promote this idea. Recently they were joined by Thomas Schomerus, professor for public law, particularly energy and environmental law at Leuphana University, Lüneburg, Germany. Prof. Schomerus set up the 'EnERgioN' research project in January 2012 for further investigation. 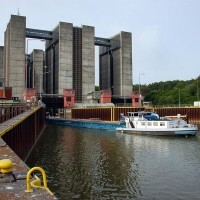 The Elbe Lateral Canal between the Scharnebeck boat lift and the lock at Uelzen was chosen as a case study.